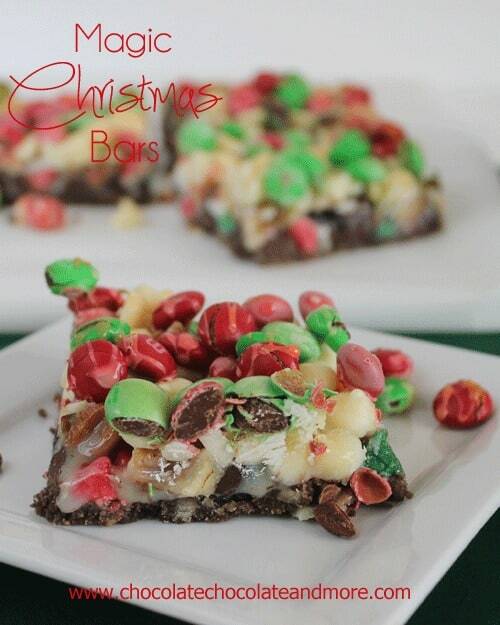 Magic Christmas Bars - Chocolate Chocolate and More! Do you ever wander around the grocery store with a list. Intent on only getting those items that are on your list and nothing extra? I always take a list when I go shopping. I have a different list for each store I shop at. I know where the best prices are for things like toilet paper (Dollar General) Meats (my local Freshway first thing in the morning) Butter (Kroger when they have a sale.) For my big run it’s always to Walmart. Milk, eggs, flour, sugar, the usual stuff on the list. I wander around the store before heading to the grocery section, especially this time of year. Finally in the food area, I go slowly down the baking isle. There might be something new I need to have. Or chocolate chips might be on sale. You can never have enough chocolate chips. Just before Thanksgiving, they put out all the holiday baking items. 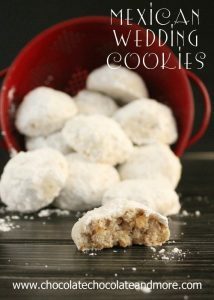 I’m such a sucker, a big display, and these Holiday Morsels are just calling to me. Red and Green Chips, mixed in with semi-sweet. Luckily, only 2 bags jumped into my cart. Home and put away, I forgot about them. Until today. I was all set to make something else, I had the idea in my head, I was excited about it. Then I saw these chips. Christmas is next week. I have to do something with them. I could have just whipped up a batch of Chocolate Chip Cookies but I was in a bar mood. Then it hit me, Seven Layer Bars, I’ll just change up the layers. I go through the cabinets, pull out what I need and 40 minutes later, I’m tapping my foot waiting for these to cool off so I can have one. 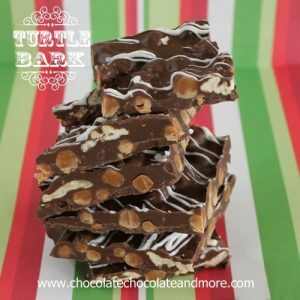 I finally went and did some laundry, made another batch of bars (I’ll share those with you next week) Made a few lists for my big shopping trip tomorrow. Finally. Cool enough to cut and try. 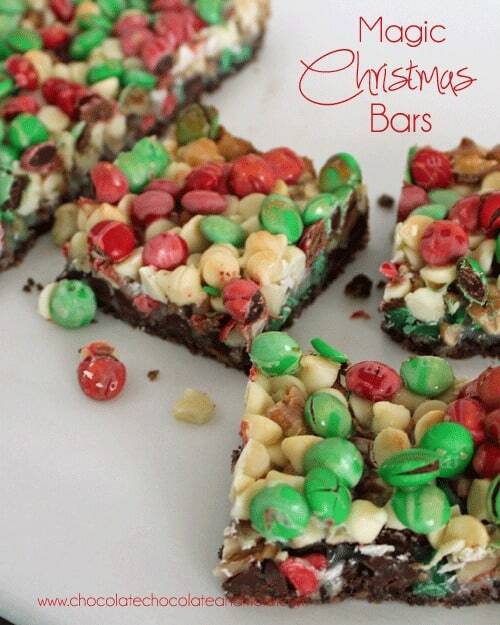 These bars are perfect for the holidays. A warning, they are super sweet but my family all said they were amazing and don’t change a thing. Preheat oven to 350 degrees. Lightly spray or grease a 9 x 13 pan. 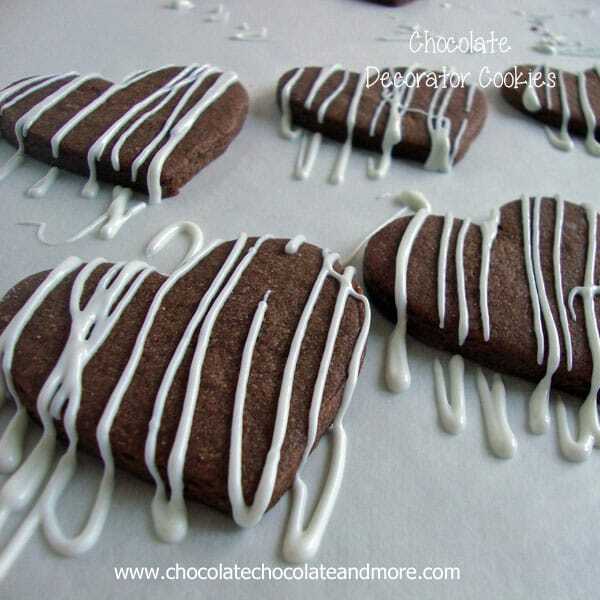 Combine crushed cookies, cocoa and butter till combined and cookie crumbs are moist. Spread evenly in bottom of pan, pressing down to form a crust. Now start layering the rest of the ingredients. 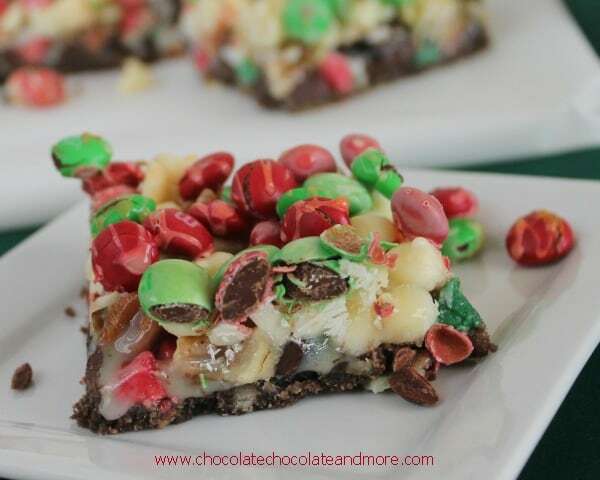 Holiday Morsels, Pecans, White chocolate chips and most of the M&Ms. I kept out about a handful to sprinkle on after the milk. Drizzle sweetened condensed milk over the entire pan, make sure to cover all the nooks and crannies. Sprinkle remaining M&Ms on top. I love all the color in these bars! 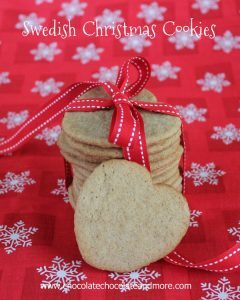 And here are a few more holiday treats! So pretty! I am jealous, as I have not seen the holiday morsels in my grocery store. I may have to brave WalMart just to see if they are carrying them! I’d like a little magic in my mouth right now! YUM! I had to pin this!! I have that same problem with stuff jumping into my cart, despite the fact that I always go shopping with a list. 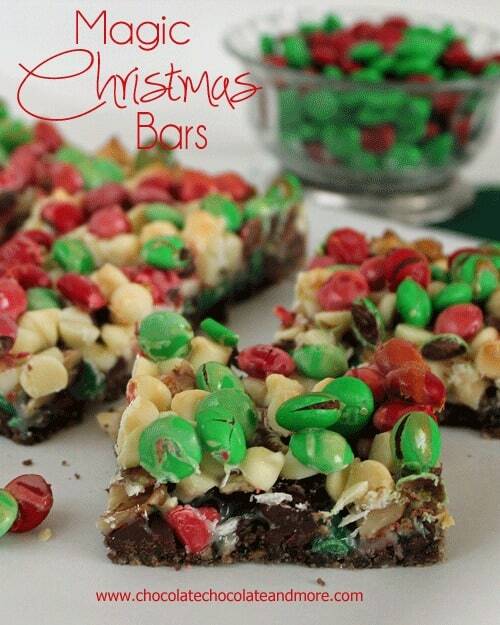 I could definitely go for one of these festive Christmas bars right now – yum! I linger in the baking aisle so much…and stuff always jumps in my cart!! 🙂 These are gorgeous! Magic bars rock. Wow, that is a masterpiece! Very visually impressive & divine bars! Ha ha, I totally wander the baking aisle Everytime! Even though 90% of the time I have no reason to be there! These look beautiful – so festive! Joan, these are so festive, I imagine they’d disappear like hot cakes where ever you took them! These are perfect for Christmas! Love the green and red touches. I would have a very hard time just eating one!!!! Drool worthy treats that I know I could keep on the counter long. I love the festive M&M’s I always buy the holiday ones so now I can do this for another holiday too! This post REALLY grabbed my attention. 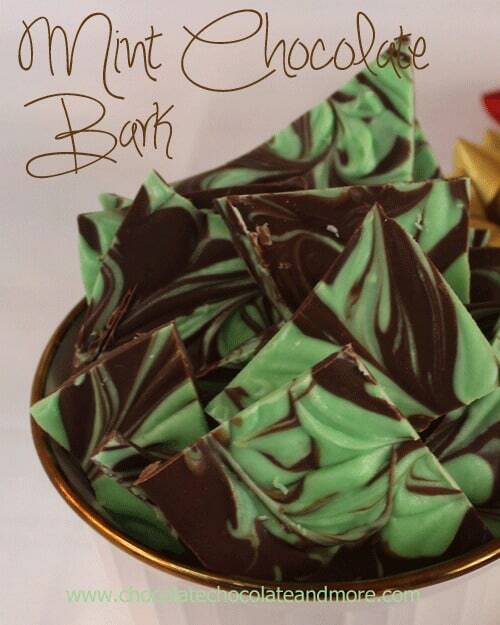 The recipe is so pretty with all the red and green M & M’s. I bet my kids will eat these as soon as they come out of the oven. They look wonderful. Thanks for sharing the recipe! Made these for a friend’s Xmas party and they were a hit! One person called them “heaven”!